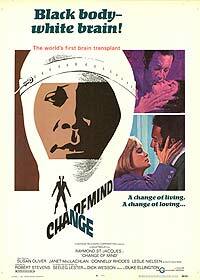 Change of Mind (1969) - Sci-fi-central.com.  USA  1969  98m   Directed by: Robert Stevens.  Starring: Raymond St. Jacques, Susan Oliver, Janet MacLachlan, Leslie Nielsen, Donnelly Rhodes, David Bailey, Andre Womble, Clarice Taylor, Jack Creley, Cosette Lee, Larry Reynolds, Hope Clarke, Rudy Challenger.  Music by: Duke Ellington. Here lies the conundrum: When and if we do realize the theory of transplanting brains,who survives? - the brain donor or the body donor? Who is the donor and who is the recipient? This movie, however, makes it clear that the brain's owner is the survivor but nevertheless he becomes a changed man, a white man who after experiencing racial discrimination, begins thinking like a black man. The fact that he is a District Attorney does not shield him from racism and surprisingly, even those who knew that he used to be a white man changed their attitude towards him. Made a few years after the anti-racial discrimination laws were passed by the Johnson administration, this film seemed to rub it in onto racists and segregationists. The wonderful jazz music of Duke Ellington helps this movie along. I wish I could hear the soundtrack again. Review by Deusvolt from the Internet Movie Database.